Taking on your father's trade is a time honored Chicago tradition, from the Guillens getting dirty on the diamond, to Richard Daley being dirty enough to buy them. 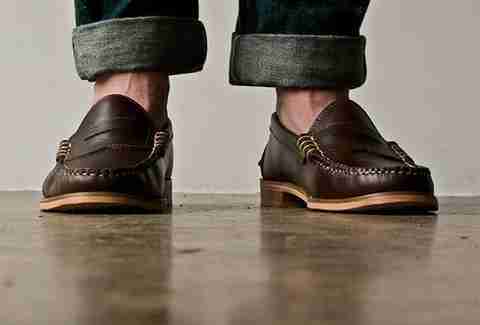 For kicks made by the next generation of hands, check out Oak Street Bootmakers. From a Chi-based cobbler's son who started tending the shoe shine stand at his dad's shop as soon as he could hold a brush, OSB's a line of handcrafted, built-to-last prep-casual shoes made entirely in the US of A by shoemakers with a minimum of 20 years in the game, which now entitles them to annual weepy faux-retirement press conferences. Each pair's made from hand-picked, uber-durable Horween Chromexcel leather hides that undergo a 100-year-old 89-step process that includes treatments with chrome salts, food-grade beef tallow, and cosmetic-grade beeswax, a step that nobody minds. 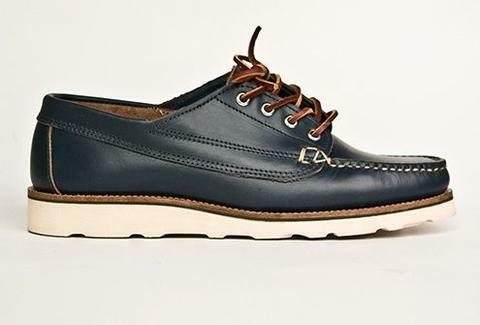 Styles include classics like rawhide-laced & wax-stitched boat shoes fitted with deck soles, and "Trail Oxfords" that rise a little higher on the heel and rock darker Vibram soles; there's also a penny loafer called the Beefroll that features stacked-leather heels, construction durable enough to stand up to non-Slim Jims. Each shoe's lifetime's extended thanks to replaceable outersoles, and ongoing beauty comes courtesy of accessories from Brazilian horsehair brushes, to Venetian shoe cream, a longtime cobbler trade secret for keeping shoes sparkling clean, even those worn Daley.